Well, it is only noon but I got an early start and since I’m at a computer cafe I will post some photos from today. 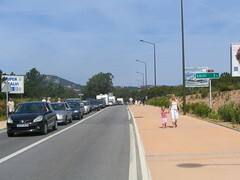 I am in Calvi, about 20 km from Ile Russe. 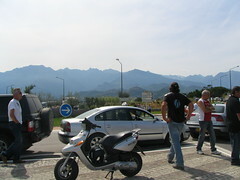 There was a big traffic jam and I when I got to the front, there were taxis blocking the roundabout. i ASKED someone about it and he said that they were striking because of the high costs of gas. People were stuck for maybe 2 km back. They were missing their flights, train connections, and being forced to stay still in the heat, but no one was beeping their horns! It was completely quiet. I could not imagine something like this happening in the US. Leg pains? No thanks, I’ve got enough of my own. Actually, my legs are feeling pretty good. So now I am off. My plan is to continue along the coast, probably to Bonifacio, where I will take the ferry to Sardinia. Im so jealous of you! But really I am so proud of you! It looks so beautiful out there. Christelle, thank you so very, very much for taking care of my Heather. I appreciate your hospitality. Yes, these are great photos Heather is taking. She is having a fantastic time and adventure, that is for sure. The pictures look amazing! I’m glad you are having a great time and I look forward to seeing more pictures. wow, i’m so envious. i just got back from a week of backpacking in the woods, and 2.5 months would have been so much better. 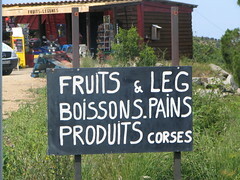 especially on a bike, on the coast of france. but in san francisco, the cars also did not honk like they do in NYC. Did the people in traffic know it was caused by the taxi strike?